No colour expresses love, passion, power and energy as emphatically as the colour red. Magnificent, rich and captivating, red has that mysterious magnetism to lure us to into a world brimming with energy. A deep luminescent red is what gives the ruby gemstone a unique identity. Ruby is rightfully termed the ‘king of gemstones’. It is strongly believed that just as the colour red which portrays the most intense emotions, ruby too symbolises the power or blood of life. Its strong association with life has made it a highly esteemed gemstone since antiquity. The passionate, rich colour of ruby throws much light on a rich legacy. The word ruby comes from the Latin word ‘ruber’ which means red. Ruby is known as ‘tabtim’ in Thailand which means ‘pomegranate’ in Thai owing to their resemblance to the red seed inside a ripe pomegranate. They are a pink to blood-red coloured gemstone variety of the mineral corundum (aluminium oxide) and are today, one of the most sought after gemstones due to its durability, hardness, rarity and lustre. Rings, earrings, necklaces, bracelets, pendants, engagement rings, eternity rings and bridal set rings in ruby gemstone is available in plenty in the markets. AG & Sons, one of the most established jewellery stores, has an endearing range of ruby jewelleries like ruby bracelets, ruby necklaces, ruby pendants, ruby earrings, ruby engagement rings, ruby eternity rings etc. Designed by our experts, they feature designs which are a subtle blend of contemporary and traditional. Indeed, with the immense significance it holds ruby makes for an exquisite gemstone with a vibrancy that is unsurpassed by any other. The Orient describes ruby as ‘A drop of the heart’s blood of Mother Earth’ and they believed that it contains the spark of life. Ancient orientals were of the opinion that ruby is self-luminous and hence named it ‘glowing stone’ or ‘lamp stone’. The emperor of China was believed to have used ruby to light up his chamber. As per the Hindu priests even the homes of the Gods were lighted by rubies. The ancient Indian language Sanskrit referred to ruby as ‘ratnaraj’ which implies ‘king of precious stones’. One is assured to be reborn as an emperor if ruby was offered to Lord Krishna as per the ancient Hindus. Some ancient cultures also held the notion that rubies grew on trees like fruit. Ruby was also believed to have the power to forewarn the wearer of an impending disaster. King Henry VIII’s wife was said to have prophesied her death from the darkening of her ruby. Because of its association with blood, ruby was considered to be an ideal stone for soldiers. They were apparently inserted into the flesh of the soldiers and made a part of their own body. The soldiers who wore the stone in this manner were believed to be spared from wounds and injuries. The story of Marco Polo states that Kublai Khan offered a city to the King of Ceylon in exchange for a large ruby. As per a Greek legend, a female stork was said to have repaid Heraclea’s kindness by giving her a ruby so bright that it lighted up her room at night. The people of the Medieval Europeans believed that rubies blessed them with good health, wisdom, prosperity and success in love life. In China, the rank of a Mandarin was decided by the colour of the ruby stone. The Bible and the ancient Sanskrit writings regard ruby as the most precious gemstones. Depending on its flawlessness and beauty, the Hindus divided rubies into castes like upper class, middle class and lower class. Even today it is believed that ruby when worn as jewellery like bracelet, ring, earring, necklace, pendant etc. brings good health, wisdom, luck, success to the wearer. It also makes an ideal engagement ring, eternity ring and bridal set ring as ruby also stands as a symbol of eternal love. 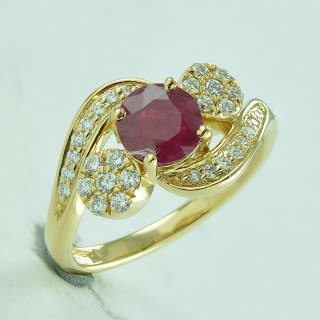 As mentioned rubies are formed from the mineral corundum. Corundum comes in two varieties common and transparent. Rubies are the red variety of a transparent corundum. Corundum is the hardest mineral known after diamond and is basically an aluminium oxide. It is a very rare mineral and is composed of a densely filled aluminium and oxygen atoms which are generally colorless. When other atoms take the place of few of the aluminium ones in the colorless corundum, bright color surface. It is the small amount of chromium that is responsible for ruby’s deep red color. In other words, a ruby is formed when small impurity of chromic oxide gets into the corundum (aluminium ions substituted by chromium). The substitution process is known as isomorphous replacement. Basically, it is chromium and another metal constituent of rubies vanadium, which gives the eye-catchy red color of ruby. If the stone formed is not red in color, it becomes a sapphire. However, it is extremely difficult to find corundum. They are usually found in alluvial and eluvia deposits and are also found in silica poor pegmatites. The ruby crystals are therefore formed at extremely high temperatures between 620 and 670 degree Celsius, predominantly in high-grade metamorphic environments where the hydrothermal fluids come in contact with limestone. Rubies are also created in the laboratory now a days. Two different methods are used: the Flame-Fusions and the Flux-Growth, the former being the cheapest methods of producing synthetic rubies. 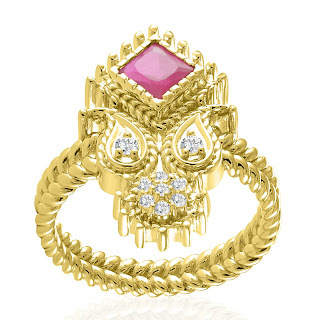 Though rare, the desire for ruby is still very much on the rise as it has always been. Ruby rings, ruby bracelets, ruby necklaces, ruby pendants, ruby earrings, ruby engagement rings, ruby eternity rings and ruby bridal set rings are still largely created to retain the much achieved fame and mystique. Sri Lanka was the earliest source for ruby where mining was recorded to have taken place as far back as 600 BC. Today, the most important sources of ruby are Thailand, Myanmar, Tanzania and Sri Lanka. The finest rubies come from the Mogok region in Burma, which is now known as Myanmar. The island of Ceylong, the ‘island of gems’ is also very famous for its light shade rubies. Marco Polo once commented that Ceylon produces beautiful rubies like no other. The African rubies coming from Kenya and Tanzania are dark red and has a brownish tinge. The Sri Lankan rubies are identified by their lavender tone and a fuchsia red features. Rubies also come from Madagascar, India, Russia, Mexico, Cambodia, North Carolina, Afghanistan and Pakistan. Pakistan is also known to source excellent color rubies however, they have a low frequency. Central Asia is fast becoming an important source for fine quality ruby. Ruby’s availability since the ancient times have enabled women to adorn themselves in beautifully designed jewelries like earrings, rings, bracelets, necklaces, pendants, etc. 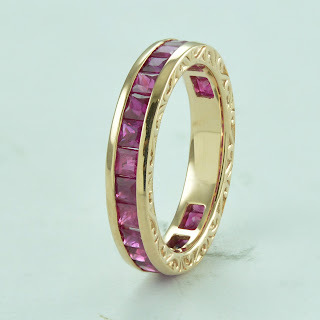 Even ruby engagement rings, ruby eternity rings and ruby bridal set rings are widely being desired these days. Color determines the quality of ruby. They come in two broad categories; reddish pink and ruby red. A strong, pure and vibrant red or red with a tinge of blue is considered to be the most sought after. This red hue is known as ‘pigeon’s blood’. A light colored ruby falls under the category of pink sapphire though in some mining areas, the pink ruby is also considered as a ruby. Ruby does display inclusions though they are a natural part of the stone. They are sometimes removed by heating. Inclusions of tiny parallel rutile needles causes an effect known as asterism in polishes rubies. They are identified as star rubies and has either six ray stars or twelve ray stars. Ruby for jewelleries like earrings, bracelets, pendants, necklaces, rings, engagement rings, eternity rings and bridal set rings are generally available in mixed-cut, accompanied by step-cut pavilions and brilliant-cut crowns. Common shapes are cushions and ovals though they are also available in round, pear, triangular, emerald, marquise cut. Rubies over one carat are rare, hence the price increases with the increase in size. Ruby measures 9 on the Mohs scale of hardness second only to diamond. As a corundum, it is amongst the most durable of all gemstones with a high density and no cleavages. Thus, they make an ideal gemstone choice for jewelleries like an engagement ring, eternity ring and bridal set ring as they can be worn on a daily basis. Since the ancient times, rubies were known to have had many positive effects. Believed by many to have a strong relation with the sun, it was thought to have a great effect on the mental and physical health of the people. The stone was largely regarded as the stone of prophecy as the colour was said to darken when any kind of danger loomed large. Rubies were known to cure liver problems and were considered great for the brain, heart and memory. Rubies were always regarded as the stone of love, passion, power, energy and a zeal for life. Ruby is said to increase the energy level, vigour, courage of the wearer. They help the wearer to overcome the stress of life and calm hyperactivity. They were believed to detoxify the blood and the body and were said to have a positive effect on the heart and circulatory system. The gemstone is also believed to promote positive dreams, positive state of mind and make the wearer stronger physically and mentally. It is a dynamic stone known to ignite the passion and enthusiasm of the wearer. Since ruby symbolises passion, and love between two people and are known to strengthen their relationship by bringing them closer, they are an ideal stone for engagement rings, eternity rings and even bridal set rings. The intense energy of ruby is known to sharpen the mind and improve the concentration level of the wearer. Due to the many positive effects it has, ruby is still worn as rings, bracelets, necklaces, pendants, earrings etc. A highly priced gemstone, with a hardness and durability like no other, it is but natural that ruby jewelleries are very much sought after. AG & Sons have a wide collection of ruby jewelleries, elegantly designed to bring the most of out of the stone. Its captivating colour is enough to augment the look of any type of designs or settings and our experts have made sure that only ruby of the finest quality and colour is used. We have a wide collection of ruby earrings, rings, bracelets, pendants, necklaces apart from our much admired ruby engagement rings, eternity rings and bridal set rings.